Hobbit houses continue being hot, especially for those who would like to buy or build a DIY tiny home and don’t care at all about mobility, property taxes, floods, etc. Before reviewing a few prefabricated Hobbit houses let’s take a look at what some of “The Lord of the Rings” fans can do in their spare time. Kristie Wolfe simply made her fairytale dream come true. Her adorable hobbit hole house has a million-dollar view in a perfect location – a small community of Orondo in central Washington. Kristie was set on the idea of building her tiny hobbit house in a hillside. I wanted the house to be buried, to be as authentic as possible. I couldn’t get a concrete truck up here. We could have mixed it by hand, but it would have been really difficult. I talked to the building department, and they just said nobody’s ever done it, but you can give it a shot. Does it look authentic? It is definitely not a hobbit playhouse – you can actually comfortably live in it enjoying nature. For gardeners tired of the noisy commotion of suburbs it offers a host of benefits. One of the main benefits would be its remote location. Gardening and getting some basic shopping done will provide you with more exercise than your current fitness club membership. Finally, you may stop dreaming about growing flowers (or wild strawberries) on your roof! 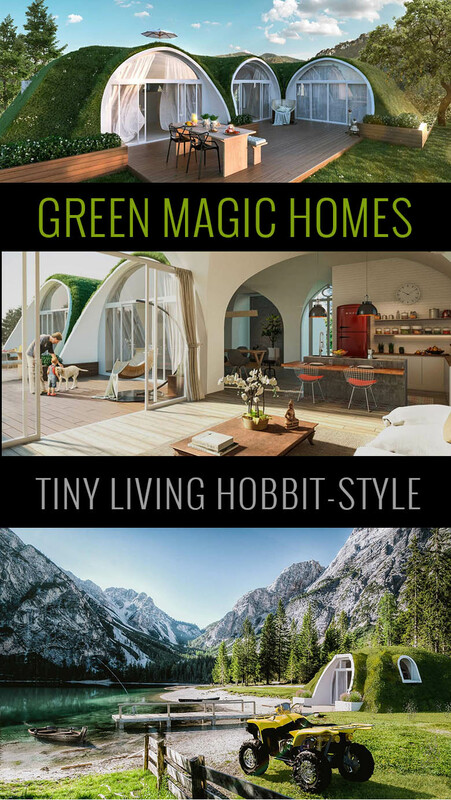 All it takes is just ordering one of the tiny hobbit units from Compass Green (USA) or Green Magic Homes (EU, USA, S. America). After delivering and assembling their patented fiber-reinforced composite shells in 3 days or so, your lovely “hobbitat” is ready to be covered with soil. 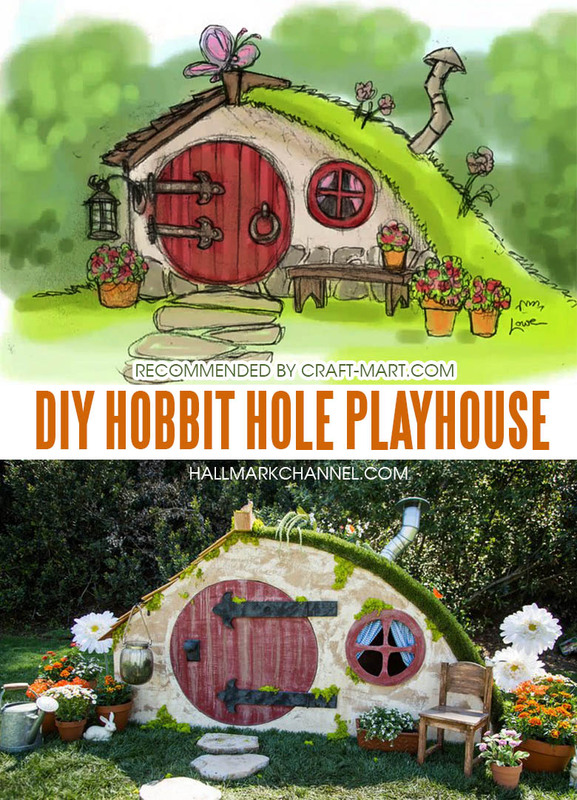 Start planning your future Hobbit Hole House with confidence! Modular units can be interconnected creating luxury Hobbit estates. You may plan your future Hole house with confidence! “Green Magic Homes” is one of the most respected of all hobbit homes builders. Its technology meets all international standards and approved to be used for building tiny homes in any country in the world. Stop envying Bilbo’s fancy house! Green Magic Homes offers an amazing line of prefabricated homes that are about as close as the ones in the Shire. They incorporate all sorts of sustainable living features into their homey, hobbit-y designs. Start living in harmony with nature! This tiny home has a magic power of changing your life. Like Mount Rainier itself, this tiny hobbit-style home is energy-efficient, like most natural things. Small enough, so it’s easy to clean, easy to own, and be closer to nature at the same time. Mount Rainier National Park with its majestic waterfalls, lush meadows, glaciers, and the volcanic Mount Rainier, is a place of rebirth. Rainier Studio is a tiny home that brings the simplicity of the outdoors indoors. 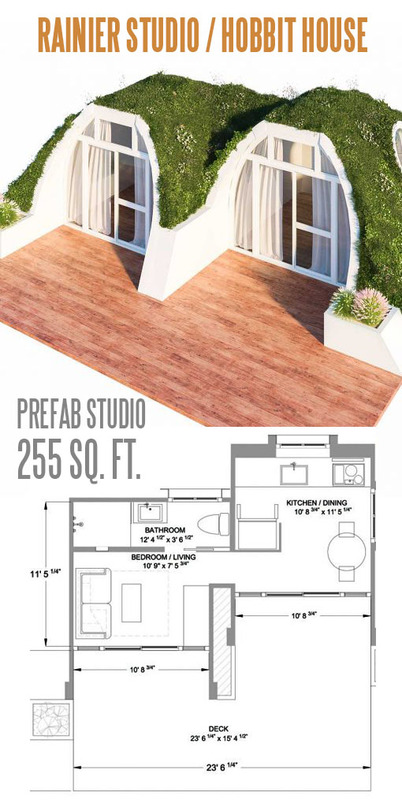 With only 225 square feet to call your own, this space makes it easy to coexist with the Earth. Imagine your roof covered with flowers during springs and summers! Sort of like living inside the flower bed. It all sounds really nice but one important thing is missing in this design, in our opinion – the cover over the entrance door. So, unless you are ready to dance in the rain as soon as you step out your front door, having a small covered porch is a must. Unlike larger conventional houses, Jasper model doesn’t waste any energy. Instead, it relies on the Earth’s ability to regulate micro-climate inside the structure. Similar to Earthships, it has to be oriented correctly to catch enough sunlight through the large glass windows and doors. 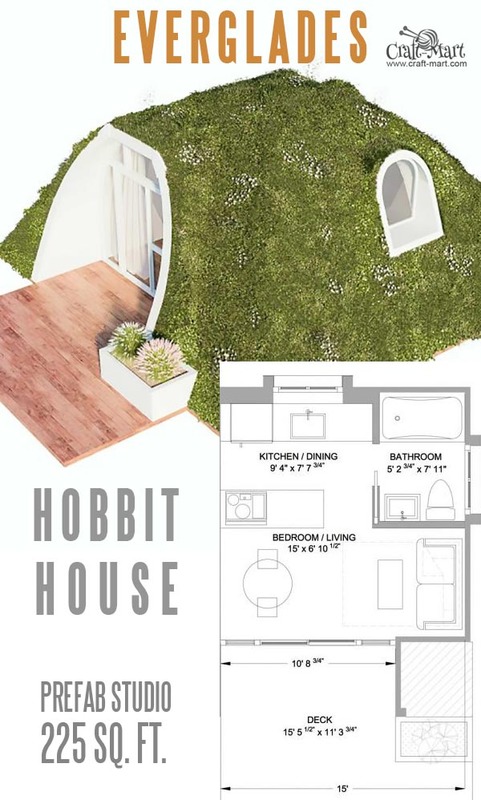 Yes, real hobbits would use smaller windows and round wooden doors… Perhaps, future home models will have them but let’s have a look at some positive things like square footage, for example. 370 sq. 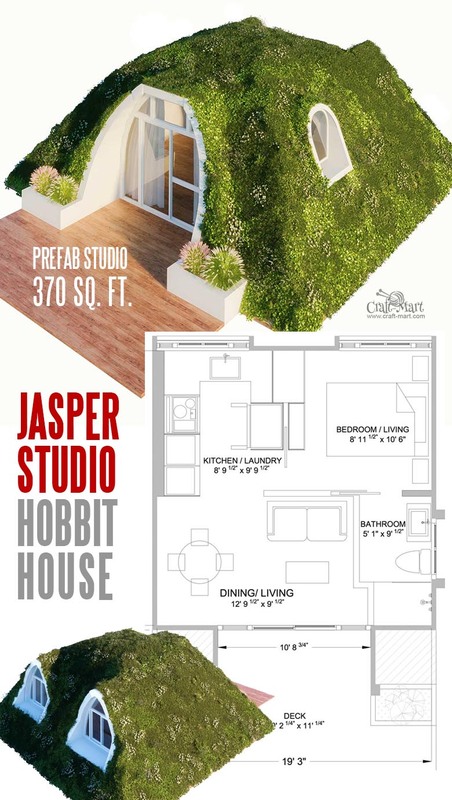 ft. floorplan with a large deck is awesome for your new hobbit life. Most of the World population lives in similar or even smaller places – 1 person per ~ 100 sq. ft. is kind of average. With 370 square feet, there’s not too much room for clutter. With eco-conscious solutions, Jasper tiny home leaves a truly small hobbit-size footprint. The last Hobbit house model of Compass Green collection is the smallest one. However, it hides a nice surprise – a real bathtub. It would be pretty awesome to brag about it to your neighbors who own Jasper or Rainier models! Compass Green definitely should think of adding some kind of porch cover to all models. Besides that, Hobbiting in this studio (i.e. taking relaxing baths) should be great! Total Area: 39.17 M² / 421.62 Sq Ft.
Oh, yes! Green Magic Homes got it right – the entrance cover is included and the cover itself is covered with a soil! Look at the gorgeous interior shots! Plenty of wall space to hang hobbit-style decor or even paint murals with your favorite scenes from The Hobbit. 35.62 M² / 383.37 Sq Ft.
Another awesome small home model under 400 sq. ft. – real tiny house. It’s not that clear why this model got Waikiki name since most of the facades are pretty much similar for all Hobbit homes. Perhaps, to live on a beach in some kind of a tropical paradise was Bilbo’s dream… Who knows? Area: 39.38 M² / 423.92 Sq Ft.
Capri Hobbit Hole house is just perfect for a couple. Watching Sunsets is possible from the porch or the couch in the living room. Not much wall space for a large flat screen TV though but who will need it when you have the most gorgeous sunsets? How Much Do Hobbit Homes Cost? A move-in ready turnkey home price is the total cost of your finished home, including the shell price, external waterproofing system with vegetation layer, and interior finishes. The estimated cost per sq. ft. for the finished home is between $125 to $200 depending on the site conditions, the level of finish, location, local building codes, and the size of the home. These estimated costs do not include the land purchase, the preliminary site work, furniture, and appliances. The most significant Hobbit House savings actually come after the structure is built. You can expect to be paying up to 80% less for your energy bills than the owners of traditionally-built homes. In addition to that, there is virtually no maintenance to the external structure of the house. Lower maintenance costs and energy consumption means that with your Hobbit house you’ll save much more over time! There are not a lot of hobbit houses for sale, so your choices are a bit limited. It takes a really dedicated fan of The Lord of The Rings to invest time and money into the piece of real estate that may not be as appealing to the rest of the population. Keep in mind that this is just a garden shed not really dug into the soil. It may ne perfect she-shed or man-cave. It looks nice but no self-respected Hobbit would actually live in one of these. 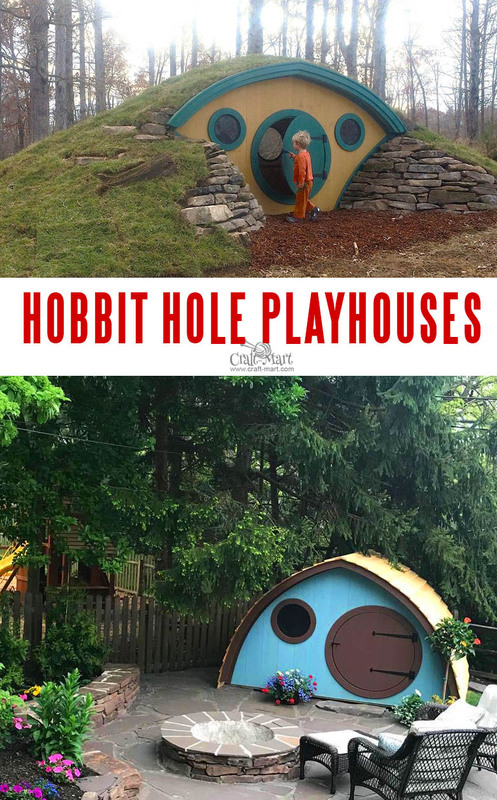 The same manufacturer offers a few Hobbit playhouse models that are scaled larger than most traditional playhouse designs and are great for big kids (such as yourself). Their size is very popular with families who have older children because the kids get a clubhouse that they can call their own. The adult-sized Faehaven design allows the entire family to enjoy your backyard retreat, even when it rains. If nothing from the previous Hobbit real estate options looked attractive to you then let your pets try Hobbit living. 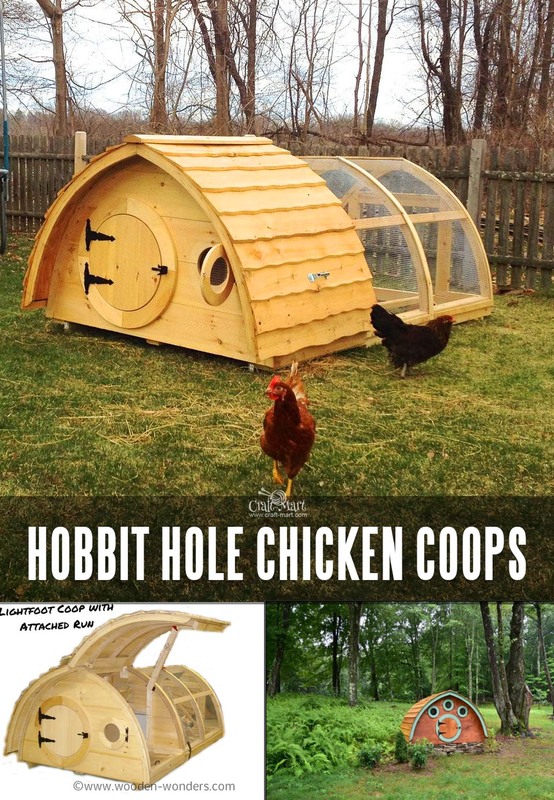 Hobbit Hole chicken coops, duck houses, or dog kennels may sprinkle some magic around your yard. Hire a Hobbit House Architect! 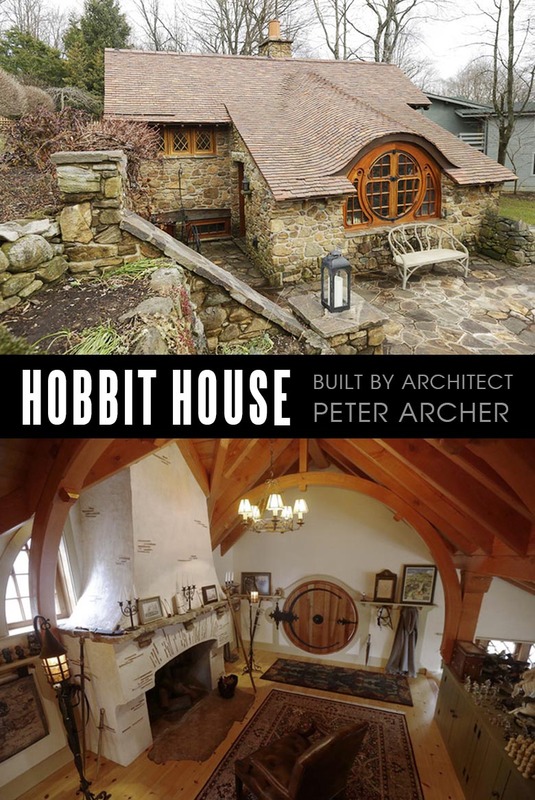 Believe it or not, there are real-life architects specializing in Hobbit dwellings. We wanted a single structure, a relaxing place that was diminutive in scale, for the owner to come and hang out and just be in solitude with his collection. Archer worked with a team of craftsmen to create this fairy tale masterpiece. The stones were taken from a collapsed section of an 18th-century low wall running through the center of the property. Lastly, for real die-hard fans trying to convert absolutely everything into a Hobbit Land, there is a nice example of what else can be related to their favorite story. Are you a fan of tiny living and want to learn more about it?